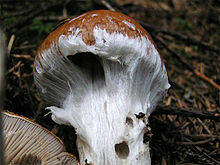 The cortina around the fungi which gives name to the genus. 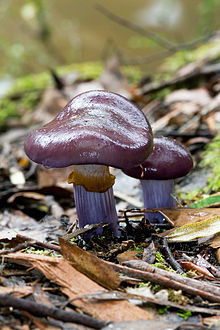 With around 2000 species, Cortinarius is the biggest genus of fungi that form mushrooms. Apart from a few species such as C. caperatus, many even so-called edible species appear to have very similar species that are at least inedible if not poisonous, or otherwise may differ in edibility geographically. ^ Kirk PM, Cannon PF, Minter DW, Stalpers JA (2008). Dictionary of the Fungi (10th ed.). Wallingford, UK: CAB International. p. 173. ISBN 978-0-85199-826-8. ^ a b c d e f Niskanen T, Kytövuori I, Liimatainen K, Lindström H (2013). 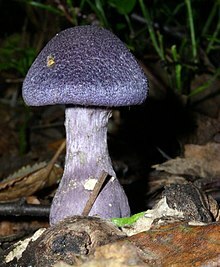 "The species of Cortinarius, section Bovini, associated with conifers in northern Europe". Mycologia. 105 (4): 977–93. doi:10.3852/12-320. ^ a b c d e f g h Bojantchev D. (2013). "Cortinarius of California: eight new species in subg. Telamonia". Mycotaxon. 123: 375–402. doi:10.5248/123.375. ^ a b c d e f g h i j k l m n o p q r s t u v w x y Liimatainen K, Niskanen T, Dima B, Kytövuori I, Ammirati JF, Frøslev TG (2014). "The largest type study of Agaricales species to date: bringing identification and nomenclature of Phlegmacium (Cortinarius) into the DNA era". Persoonia. 33: 98–140. doi:10.3767/003158514X684681. PMC 4312940. PMID 25737596. Cadinanos Aguirre, JA. (2004). Fungi non Delineati 29: Cortinarius del Subgenero Phlegmacium Raros o Interesantes. Fungi Non Delineati 29 (in Spanish). Bidaud, A.; et al. (2005). Atlas des Cortinaires, Pars 15: Genre Cortinarius (Pers.) Gray, Sous-genre Cortinarius. Fédération Mycologique Dauphiné-Savoie. ISBN 2-9514643-5-5. Moser, Meinhard Michael (2001). Fungi non Delineati 15: Rare, Debated and New Taxa of the Genus Cortinarius (Agaricales). Fungi Non Delineati 15. Libreria Mykoflora. Soop, Karl (2009). Cortinarius in Sweden. Mora, Sweden: Éditions Scientrix. ISBN 978-91-978464-0-0. This page was last edited on 19 September 2018, at 12:58 (UTC).